When a couple functions securely, love and satisfaction grow with time. Shared happiness is maximized and distress is minimized. Things feel fair, equal, just and sensitive. Riffs get quickly repaired. Past upsets do not linger as negative memories. But if a couple functions insecurely, love inevitably gets eroded over time. Issues pile up and hide the love once so abundantly shared. Little upsets turn into big fights. Negative memories can accumulate so much that it gets hard to share positive feelings. Instead of feeling secure and loving, a feeling grows that things are unfair, unjust, unequal, or insensitive. Triggering escalates—blowing up, shutting down, avoiding, walking on eggshells—until someone cannot take it anymore. A majority of couples who come to my intensive couples retreats have been functioning insecurely, sometimes for decades. Since this operates unconsciously, couples don’t realize or know how to work with what is at the root of their upsets or negative reaction patterns. In a retreat, they discover how to heal and overcome their reactivity — and learn how to become a team of two, operating consciously in ways that co-create secure functioning as a couple. Secure functioning between two partners is not dependent on each being a secure individual. It’s about knowing how to operate well as a team, so that you are able to rewire unconsciously controlled negative emotional patterns — and understand how to promote new wiring for security. 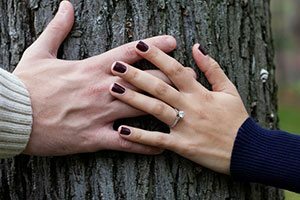 What makes a couple secure? Three key factors must be in place. Like the legs of a stool, you need all three to be solid, stable, and secure. These essential keys to secure functioning are: Prioritization, Collaboration, and Distress Relief. The primacy of the couple over all thirds is necessary for secure functioning. Partners need to know and feel they are each other’s most significant other. All other people, things, and activities come after they do. Even the kids. Even work. To function securely, each has to feel they are the top priority. Top of the food chain. And together, they operate like a team to manage all thirds. A “third” is anything other than the two of them. Any other person, object, or activity is a third. Thirds inevitably intrude on the couple system. By their very nature, thirds vie for resources — your attention, time, even money. In a competition between a partner and a third, secure couples make sure the partner is not the loser. Insecurely functioning couples will not operate this way. It will be a blur. It may seem like the kids come first. Or someone’s career. Or their parents. Or their iPhone. Feeling sidelined by a third will inevitably trigger insecurities like “I don’t matter,” “I’m last on your list,” “I’m invisible.” A sidelined partner will start to not like the third. The other partner will feel caught between this partner and the third. Most of the couples I work with come to realize that not feeling first in importance had eroded their love for years, if not decades. I’ve helped hundreds of couples straighten out this fundamental error that led to insecure functioning. This usually gets turned around in a matter of a few days in my intensive marriage retreats. Most go home saying they were as happy as when they first met! Partners suffering from not feeling first in importance is usually based on misconceptions and misperceptions. In a simple challenge to these, I ask each, “Who triggers you more than anyone else?” Inevitably each says the other does. Whomever triggers you the most is the most important person to your brain. It would be good to turn that importance around in the positive direction. Nobody can make you feel happier than your most significant other. A second key factor is that securely functioning partners operate from true mutuality. Their motto is: “All decisions must be good for both of us.” When it comes to making choices, doing things, deciding on anything—moving somewhere, buying something, going to an event—they collaborate. They want to co-create win-win solutions, in which both partners are fully involved in the decision-making process. They do not make unilateral decisions, large or small. If a friend calls suggesting an activity, they consult each other before agreeing. Things feel fair and they operate as equals, sharing decision power. They don’t compromise, they don’t try to “win” at the other’s expense, but they always collaborate to find win-win solutions. They make sure both of them are truly happy with any outcome. And sometimes that is difficult… requiring more time and creative thinking. It could be about what activity to do, this vs that, where they expand beyond the immediate single event to map out how to do this and that at differing times. “Chinese vs Italian food tonight?” might be answered by “Mexican” we can both agree we want, or by alternating choosers. These are relatively easy. More challenging decisions — where to live, a career change — require more creativity. Go slow, make sure you know your partner’s entire perspective as well as your own, and allow your good will and creative minds to lead your way. But quickly pause the discussion if you detect distress (more below). Many couples arrive at my intensive marriage retreats not being that skilled in collaborating with each other. This usually results in lingering upsets that have eroded their ability to feel happy together. Sometimes, each has a list of particularly painful unilateral decisions their partner made. After engaging in some activities that teach collaboration skills in fun ways, they start to repair those past wounds — and get the experience of sorting out important future decisions using their new found collaborative tools. Securely functioning couples operate like partners in a three-legged race. The principle is that “if you fall, I fall.” Hence, neither partner will allow either of them to feel like a loser. Nobody gives up. Nobody takes the fall. And each person tries to get what they need by figuring out what the other person needs. They engage in creative bargaining, enticement, and even seduction. They exert influence by figuring out how to give something their partner really wants. Operating under the law of attraction: they try to make each other want it by making it attractive to the other person. They only use positive negotiation strategies. They never try to persuade the other by using fear, anger, pressure, shaming, threat, or guilt. Going to your partner for quick distress relief is a part of being in the foxhole together. Here I’ll discuss two forms of distress relief: co-regulation and repair. CO-REGULATE REGULARLY. Co-regulation is the neurobiological term of where one nervous system helps the other stay regulated, stable and secure. A simple example is a mother holding a crying infant, who soon calms down with the physiological contact. This form of interactive regulation is a native biological signal system of safety. Intimate partners also provide this for each other on a daily basis when they are securely functioning. Nothing beats supportive touch, friendly eye contact and a soothing voice tone — along with a few positive words. Many couples will attempt to co-regulate each other if one of them is distressed by a third. When suffering from a bad day at work, an argument with a friend, something not going well — most partners will attempt to give soothing or solace to each other. Of course, the intention to relieve distress may differ from ones ability to do so. For example, some people need to speak all about an incident and just be heard. If their partner interrupts, instead of just listening, this can escalate distress rather than lower it. We need to understand what relieves distress for our partner. It may be different than what does that for us. It’s relatively common to try to make one’s partner feel better for externally caused distress. But what about distress between the two of you? REPAIR EVERYTHING. It is much harder to relieve each other’s distress if you cause it. Such internally generated distress can escalate rapidly. One partner’s reaction triggers a counter-reaction in the other. I call this a reactive cycle, a negative emotional pattern that insecurely functioning couples often fall into. Yet in the end, distress is distress regardless of cause. Securely functioning couples quickly relieve each other’s distress — especially if they cause it! Certainly, when the distress is co-triggered between the two of you, you have to become more skillful. This involves the ability to pause, calm yourselves down, and then quickly repair each other’s distress. Insecure couples must master the skill to do this. It’s what I call Relationship CPR. I have written about Relationship CPR in another post. You can acquire the skills for repair in detail in Five-Minute Relationship Repair. Gathered from decades of working with couples in my intensive retreats — this book helps you discover what’s at the root of reactive patterns and teaches you ways to quickly stop and repair upsets before they lead to major disconnects. Why take on mutual distress relief? Are we not culturally trained to believe that everyone should be responsible for their own feelings? Sorry, those platitudes only result in insecure functioning. Following such ideas has led people to detach from each other when upset, and big emotional walls usually result. It is important to realize that the couple operates as a primary biological survival system, a basic mammalian herd-of-two. As in any herd, all members’ survival alarm systems are wired together. If one runs, then within seconds they are all running. Subcortical survival alarms all react together, as if wi-fi connects them 24/7. Such is a herd of mammals. Similarly you and your partner form a survival herd. Your subcortical survival alarm systems get wired together. If your partner’s distress alarm starts ringing, so will yours within seconds. Like in a three-legged race, if they fall, so do you. It’s obvious in a three-legged race, that taking care of each other serves mutual self-interest — rather than blaming each other if someone starts to lose their balance. It’s in your mutual interest to keep each other upright. In the same way, it is in your self-interest as part of a couple system that both of you feel good. You can only feel as good (around your partner) as they are feeling good about being with you. It is entirely mutual. Lack of repair puts you on a path of ever mounting distress. Eventually, even little things will trigger big upsets. So, it’s in your self-interest to repair everything. It is in your self-interest to relieve each other’s distress and engage in quick repair. To put each other first. And to make sure all decisions are good for both of you. These three key factors are ideals to guide you. Strive for them. Of course, nobody will be perfect. There will be times that you trigger each other. Okay, just repair it. There will be times you blunder with thirds and your partner feels sidelined. Repair it. And do something to make up for it. There will be times when it is hard to collaborate and find a win-win. Think larger and make something else a win for your partner, if they feel they lost this one. Commit to operate out of these principles and you can establish conscious guidelines for who you are as a securely functioning couple. They become the new rules you make together, that carry you forward in a way that fosters lasting love and happiness. Why have rules? If you automatically have operated as a securely functioning couple — which means you probably do these three key things organically — then you don’t need rules. Just keep doing what you’ve always been doing. But if you have symptoms of insecure functioning then your automatic behaviors do not lead you to feel secure with one another. So you will need to upgrade and follow something other than your thoughts, feelings and impulses. That’s where the idea of social contract comes in. That’s why societies have laws: to remind people to do what they may not feel like doing (like stopping at a red light) because ultimately it’s in their self-interest (not to collide with another car). In my marriage retreats I help couples put their relationship on a positive track by discovering the tools they need for secure functioning. By the end of the retreat, using the tools they acquire, they have rebuilt positive feelings of connection, hope, and trust. To stay on track, most couples I work with will turn their discoveries into new rules for themselves, agreements or laws for how they will operate as a couple. They take these rules home with them, along with the tools to succeed at applying them to daily life. I have repeatedly seen the three keys above to be the most powerful new laws couples can make. They are like living vows that carry a partners forward in a positive direction, helping them to share a lifetime of happiness together.